Boarding on ferries in Greece is always an experience in itself. Today the boat is pretty empty but even then they try to put the cars as close as possible together and in the past it happened a few times that I had to leave the car through the passenger seat because I barely open my door. In the past, the ferries were often heavily loaded, but due to the current electronic ticket system that should not happen anymore. Yet the boatmen try to put the cars together as tightly as possible, it will be the power of the habit. In any case, the process is often quite a spectacle and you should not let yourself to be rushed. 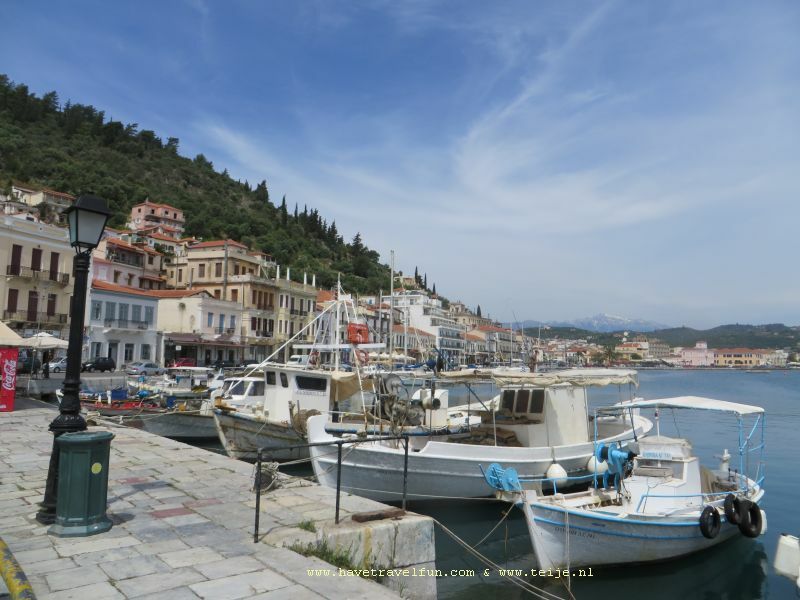 It takes a while before we are really out of the harbor because cars and trucks keep arriving in the harbor at the last minute and apparently this is not a problem because the captain is not in a hurry to leave so we can stay for a while to watch Zakynthos town. We have been on the island for 5 days and it was actually too short to see everything. But that was also due to my sore knee so we could not walk much. In the coming period we will have to take it a little more slowly than normal. In Kyllini we need to refuel gas and the pump clerk offers to also check the oil. And that is a good idea because of all the driving through the mountain, the car has used quite a bit of oil and we have to refill almost 4 liters! I should keep a closer eye on that. Then we drive north and leave the Peloponnese via the toll bridge at Rio. We drive in one go to Ammoudia on the west coast of the mainland where we have reserved our next apartment for four nights. It is warmer here than on Zakynthos and we first look for a cafe at the edge of the village. Ammoudia is located on a bay with a large sandy beach where, in addition to ordinary beachgoers, a lot of campers are parked. Parasols and sun loungers are available on a large part of the beach and some parts of the beach are clearly claimed by hotels. We are going to look for a quiet beach in the coming days, but if there is no other option, there is always a place here. At the apartment I have to call a telephone number and a moment later a woman arrives with the keys. I can practice my Greek again because she hardly speaks any English. That surprises me again and again, especially in these kind of tourist resorts. In the east of Greece more tourists come from the former Eastern Bloc and some Greeks there speak some Russian, but here the tourists come mainly from Western Europe. Today we drive a stretch along the northwest coast of Greece, a part where you rarely hear or read anything about. Igoumenitsa is located 40 kilometers north of Ammoudia and is a large port town from where ships sail to Corfu and Italy. From Igoumenitsa, tourists often go to the east or south but rarely to the north. There are a few villages in this area but not many beaches and along the coast we see mainly the big nets of fish farms. The Mediterranean Sea is overfished by the many countries that have fishing rights and especially in Greece they have started on a large scale with fish farms. From Igoumenitsa to the north we see more of them than we have ever seen together in the whole country and 70% of the fish in Greece seems to come from this kind of nurseries. The further we get to the north, the narrower the strip of land becomes that still belongs to Greece. We drive between the sea and the border with Albania and when we see a sign to a border station, we drive there. Occasionally a car comes through but it is not very busy, it is mainly Albanians who enter the country. We would like to take once the way through Albania to Greece but the last (and only) time we have in Albania, we found the roads very bad but that is already 10 years ago, maybe they are in much better shape now. The only village of any significance is Sagiada where some rooms are for rent and there is a campsite near the coast. There is a harbor from where a ferry goes to Corfu and on the pier there are a number of restaurants where we take a break. Although it is already July, there are virtually no tourists to see although there is a nice beach nearby. There is a swampy lake where we see a lot of herons and other water birds, but otherwise this region is not really interesting. We turn into a mountain road to see the St. George monastery but soon the road becomes so bad that we do not dare to continue with our car. There are a few shabby looking farms with cows and occasionally we see horses along the road but for the rest it is a desolate area. Via Igoumenitsa we drive back again. As soon as you enter the city the whole atmosphere changes, it is very crowded here, full of cars and everything revolves around the 2 ports that are there. As a city, Igoumenitsa does not have much to offer, it is typically a station to travel on. We drive south again and start looking for a not too crowded beach and find that a bit south of Ammoudia. On both sides of a bay are two large beaches and at the ends there are a lot of caravans and motorhomes that seem to have a permanent place. But there is room enough, maybe also because it is far from the main road and you really have to search for it. In Ammoudia the river Acheron flows into the sea and in classical antiquity the Acheron was one of the five rivers of the underworld where the deceased went. Now you can view the springs of the Acheron at Glyki. At the parking lot young men try to sell us all kind of things including waterproof bags but we just want to walk a bit as far as we can. Because after a while you have to walk through the water and sometimes even have to swim. At first it is shallow but at a certain moment you have to go deeper into the ice-cold water. The temperature of the water is about 10 degrees and the current can be quite strong and the boulders in the water are quite slippery. For us it was unfortunately no longer possible to proveed at a certain moment and we walked back. But that is not a punishment either because the area is shady because of the woods and beautiful to walk through. There are also parts of the river where you can sail with kayaks or a rubber boat with a guide. It is a wonderful area to be with such hot weather and it is not even that busy. We sit down on a terrace along the river and the cold of the water makes it very pleasant to sit here. Until suddenly a number of coaches enter the grounds and the tourists flow out, for us the sign we have to leave. Via another route through a plain full of agricultural land between the mountain ridges we go again in the direction of the coast near Plataria. The small town is located on a large bay with a small boulevard from where you can see Corfu. We drive to Syvota, a more famous beach resort with a beautiful coast full of inlets and bays and 4 islands just off the coast. As in more places in Greece, here too you can best explore the hidden gems of the coast with a boat. We take a walk through the small center of the village but avoid the beaches: they are beautiful but above all very full with people. Besides a few long beaches there are also many hidden beaches that all have a name. We keep driving as close as possible to the coast and notice that more and more stretches of beach are being claimed by hotels. The road runs high above the beaches through the hills and there are steep roads leading to the beaches. From parking places we can occasionally see the villages and the beaches down there. And we regularly see people along the road picking something from the trees and shrubs along the slopes. We have no idea what it can be but it sure is popular. If we want to drive away from such a parking space we are approached by a tourist with bloody leg. It is a Dane who has been looking for a certain beach for hours and during his scrambling over the rocks he has cut his leg. But he is very tired and thirsty and asks if we can drop him off at the small Drafti beach. There are not signposts at all beaches and we have to study the maps where it could be, but we give him a bottle of water and eventually we can drop him off somewehre in the neighborhood of the beach. In the short time that we are in the car together we exchange a lot of travel experiences and agree that we think Norway is the most imposing country concerning nature but that Greece has the better climate. I used to hitchhike a lot through Europe myself when I was young and then I already thought that, when I had a car, I would give as many hitchhikers a lift as possible. You meet so many different people and often have very nice and instructive conversations. This was only a short lift, but it always gives me a good feeling when we can help someone. Ten minutes later we enter Perdika, a town on a 250 meter high hill, a few kilometers from the sea. The pedestrian zone in the center is completely crammed with terraces and restaurants but there is nobody to see, the village seems to be completely deserted. Probably everyone is on the beach because it is still very hot today. Even most restaurants are closed and we must do our best to find one where we can get something to drink. When we take a walk through the town later we also almost meet no one. With this heat we also want to go to the beach and drive to the Bay of Odysseus that we found yesterday. Here the sirens would have sung, half-goddesses with the body of a bird and the head of a woman who would tempt seamen with their song to sail closer to the coast where they would crash on the rocks. Odysseus stopped the ears of his crew full with wax and let himself to be tied to the mast so he could hear the song but could do nothing. Thereafter, the sirens lost their magical abilities to lure seamen and turned into boulders except for one that collapsed in the sea and drowned. After an hour on the beach we drive back to Ammoudia where we first look for a restaurant along a stretch of the Acheron where the river looks like a canal and there are dozens of boats moored. Then we take a walk on the wide beach where it is not as busy as we expected. Tourism has not yet developed as strongly here as in places like Syvota or Parga and it is ideal to go with children because the water only slowly deeper. But we like the beach at the Bay of Odysseus much better.